This is a brilliant one-pan dish packed with punchy green peppercorns. The sauce is also great with steak or chicken. 1. Heat the butter in a large frying pan until foaming. Season the chops and add to the pan, frying for 4-5 minutes on each side, or until cooked through. Towards the end of cooking, add the sage leaves (if using) and garlic, then baste the meat with the butter. Remove the chops to a plate and cover loosely with foil. 2. Discard the excess butter from the pan and pour in the Worcestershire sauce. Simmer until reduced by about ½, then pour in the cream and a splash of water; simmer again until creamy. Add the peppercorns, taste and season, adding a splash more cream if it’s too punchy. 3. 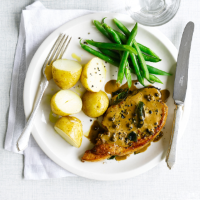 Serve the chops, spooning the sauce over the top, with steamed green beans and new potatoes, if liked.